There are many great songwriters in New Orleans, but we would like to introduce to you one in particular, Alexis Marceaux. Her name and face may be familiar to New Orleans concert goers as that energetic female singer in the veteran rock band, Glasgow. However, she also holds her own as the front-woman of her solo project, with an all-star backing band. Alexis departs from her traditional instrumentation in her new album "Orange Moon" with the help of Rick Nelson (of Polyphonic Spree), Sam Craft (of Glasgow), and the kitchen sink of musicians. It seems like everyone from Sun Hotel to Big Sam, to my grandmother are on this album. Combine tack pianos, a heavy helping of strings and horns, other strange noises, with almost Disney like pop tendencies, put just the right amount of reverb on it, and you come up with "Orange Moon." 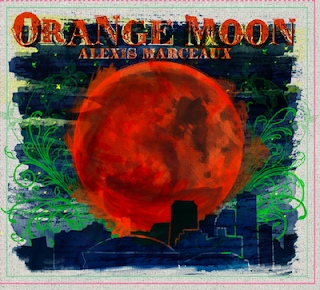 Alexis Marceaux and the Samurai celebrate the release of "Orange Moon" tonight, with the help of Sun Hotel and Butter and Jelly (the wonderful Ben and Julie from Giant Cloud).